It's been a while, no? We have made it out of Houston (just ahead of a Flood of Biblical Proportions) and are comfortably ensconced in Vermont at the moment. I've taken advantage of the Grandmothers to get some knitting done. But in order to have at least a few posts over the next few days, I will not talk about all of it here. First up: ta da! The first of the TdF socks is done in it's first incarnation (the cuff is going to be adjusted when I get to London and the rest of my yarn for this project). 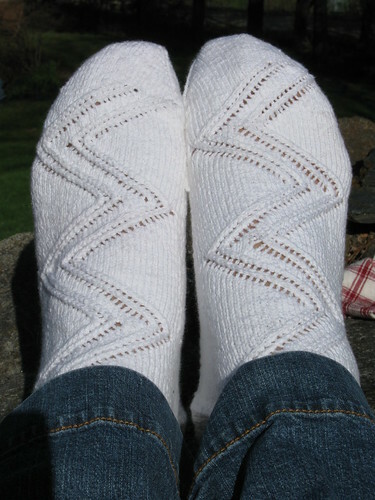 Pattern: my own, to be available in late June. Yarn: Cascade Fixation (98% cotton/2% elastic), 100 yds/50 gr. For a women's size 10 I used about a ball and a half. Gauge: 7.5 stitches/12 rows per inch. These anklets are knit from the toe up, with an easy lace pattern reminiscent of the switchbacks on Alpe d'Huez, one of the most famous and storied climbs in the Tour de France. Easy, peasy and quite comfy for the hot days of summer, whether or not you're riding your bike! Written by porpoise On April 29, 2009 In "FO", "PS Cardinal Directions", "PS North", "SAM", "TdF project", "designs", "socks"